Star-Lord (Peter Quill) is a fictional Character, a superhero appearing in comic books published by Marvel Comics. Created by Steve Englehart and Steve Gan, the character first appeared in Marvel Preview (Jan. 1976). The son of a human mother and alien father, Quill assumes the mantle of Star-Lord, an interplanetary policeman. 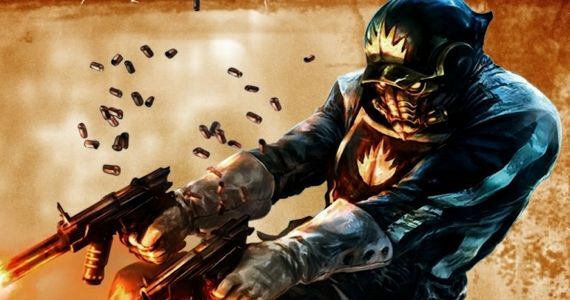 The character played a role in the crossover comic book events Annihilation (2006) and Annihilation: Conquest (2007), and became the leader of the space-based superhero team Guardians of the Galaxy in the 2008 relaunch of the eponymous comic. He has been featured in a variety of associated Marvel merchandise, including animated television series, toys, and trading cards. Chris Pratt is set to portray Star-Lord as the lead character in the 2014 live-action film Guardians of the Galaxy...More about Star Lord Character Review...Keep reading !! 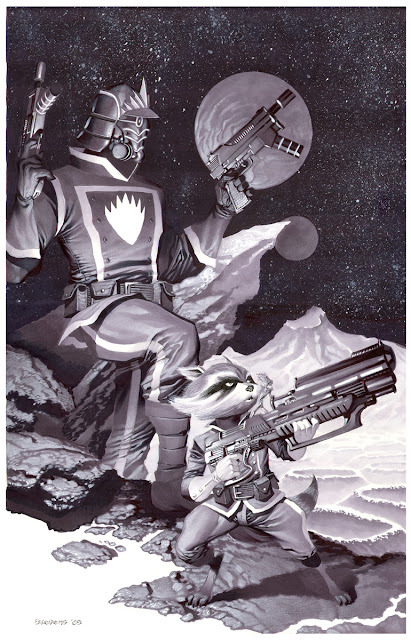 Star-Lord is a master strategist and problem solver who is an expert in close quarter combat, various human and alien firearms, battle techniques and has an extensive knowledge on various alien customs, societies and cultures, as well as various knowledge about cosmic abstracts such as Oblivion. As Star-Lord, Peter Quill wears a suit that grants augmented strength and durability and the ability to travel through space. The character also uses an "Element Gun," a special meta-pistol capable of projecting one of the four elements (air, earth, fire and water). Star-Lord also shares a psychic link with his sentient space vessel, "Ship." The Ship is actually a sapient energy form. She most often exists in the form of a starship, but can alter her structure at will. She can travel through air, space and water. She possesses many of the conventional starship accessories, including shields, energy blasters, advanced sensors, replicators (able to form any kind of food, drink, etc. ), and hologram projectors. She has proven capable of creating a human form, which she can then animate and use as a host. Even if completely destroyed, she is capable of restoring herself, since her true form is her consciousness. In addition, she takes on a number of feminine characteristics, such as a mothering instinct for those she is partnered with. She has felt deeper attachments, including love for her partners. Ship can create Widgets—small, mobile droids able to scout out situations, gather information, and then return to her. The full extent of Ship's abilities are unknown. During Star-Lord's battle with The Fallen One, his Elemental Gun, suit and Ship were destroyed. Due to severe injury he was grafted with cybernetic implants by doctors on the Kyln, where he was sentenced. The eye implant allows him to see all energy spectrums and the memory chip in his brain gives him 100% total recall. On the Kree world of Aladon Prime Star-Lord's cybernetic implants were removed. Star-lord was outfitted with a Kree issued heat-dampening-espionage-battle suit, which became the hallmark look for the Guardians of the Galaxy, battle helmet and a universal translator, all of which he still uses. His battle helmet analyses strategy data, can improve vision and regulate oxygen when in space. 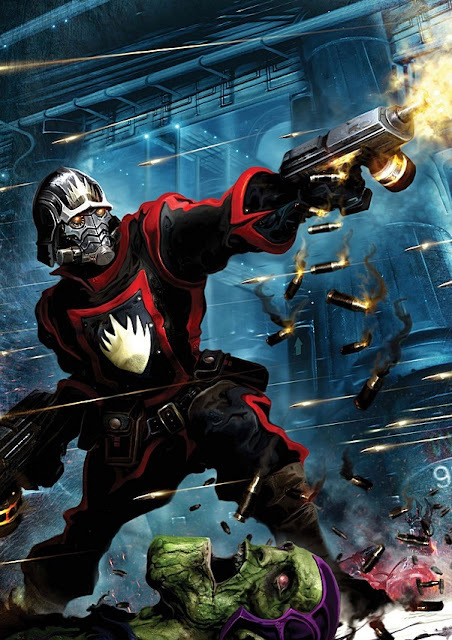 Star-Lord's chosen weapons are two Kree sub-machine guns with various types of ammunition, including explosives. Star-Lord makes a non-speaking cameo appearance in the animated direct-to-video film Planet Hulk. Chris Pratt will portray Star-Lord in the Marvel Studios film Guardians of the Galaxy, which is scheduled for an August 1, 2014 release.